One of the most beautiful representations of upper Manhattan ever printed. 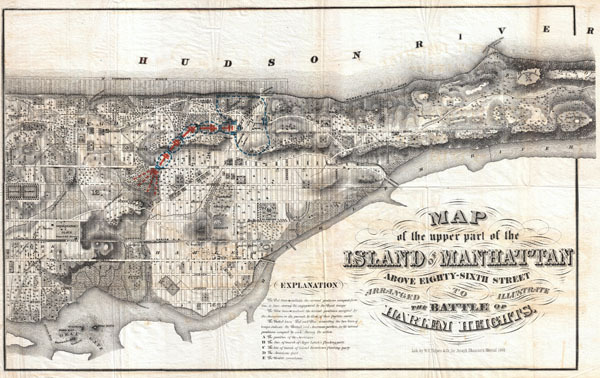 Map of the upper part of the Island of Manhattan above eighty-sixth street arranged to illustrate the Battle of Harlem Heights. A stunning and rare 1868 Map of the northern part of the island of Manhattan, New York city by W. C. Rogers. Map covers the upper part of Manhattan, above 86th street (including Morningside Heights, Manhattan Valley, Harlem, Inwood, the Upper West Side, the Upper East Side, etc...) in extraordinary detail, depicting streets, buildings, estates and in many cases individual trees. This map is most certainly based upon the 1836 Topographical Map of the City and County of New York drawn by David H. Burr and published by J.H. Colton. Colton's map was perhaps the 'finest example of artistic mapmaking applied to the Island of Manhattan' (I.N. Phelps Stokes). This map uses only the northern portion of Colton's map, but features the same stunning detail. Beautifully hand colored to illustrate the Battle of Harlem Heights. This is the best map of northern Manhattan that we are aware of. Prepared for inclusion in the 1868 edition of Joseph Shannon's Manual Of The Corporation Of The City of New York . An important piece for collectors of New York City cartography. Very good condition. Original folds as issued. Minor verso repairs and reinforcement on folds. Minor age toning, especially on original fold lines. Blank on verso. Phillips, Philip Lee. A List of Maps of America in the Library of Congress, page 537.